The City of Philadelphia decriminalized possession of up to 30 grams of marijuana effective October 20, 2014, becoming the largest city in the United States to decriminalize marijuana. The City of Pittsburgh decriminalized possession of up to 30 grams of marijuana, and decriminalized possession of up to 8 grams of hashish, on December 21, 2015. On January 20, 2015 Constable Ed Quiggle, Jr. signed the Compassionate Medical Cannabis Reform Resolution, making it official policy for the Office of Constable for the 9th Ward of the City of Sunbury to not enforce or cooperate in the enforcement of any acts which prohibit, penalize, or criminalize the possession, cultivation, or use of medical marijuana, hemp, cannabinoids, and other illegal or experimental drugs, becoming the first law enforcement agency in Pennsylvania, and perhaps the first in the United States to enact such a policy. I am proud to sign this bill that will provide long overdue medical relief to patients and families who could benefit from this treatment. I applaud members of both parties in the House and Senate who have come together to help patients who have run out of medical options and want to thank the thousands of advocates who have fought tirelessly for this cause. ^ Cherney, Max. “Philadelphia Is Decriminalizing Marijuana Possession”. VICE News. Retrieved 1 November 2016. ^ “Reducing the harm: the limits of the city’s marijuana decriminalization law”. Pittsburgh Post-Gazette. Retrieved 1 November 2016. ^ Schackner, Bill. “In State College, a move toward decriminalizing marijuana”. Pittsburgh Post-Gazette. Retrieved 1 November 2016. 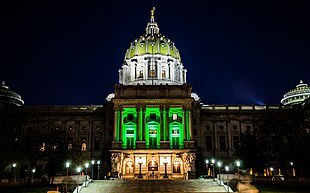 ^ “Pennsylvania Local Decriminalization – NORML – Working to Reform Marijuana Laws”. norml.org. ^ Gisriel, Sarah (26 September 2018). “Lancaster gives green light to marijuana decriminalization”. WHTM. ^ “Philadelphia Decriminalizes Marijuana”. Huffington Post. October 2, 2014. Retrieved February 25, 2015. ^ “Pittsburgh decriminalizes pot possession”. Pittsburgh Post-Gazette. 2015-12-21. Retrieved 2015-12-22. ^ “Constable’s new policy designed to protect medical marijuana patients and privacy rights”. Wilkes-Barre/Scranton Independent Gazette. 2015-01-22. Retrieved 2015-12-22. ^ “A Sunbury constable is fighting pot laws”. WKOK. 2015-01-22. Archived from the original on September 11, 2015. Retrieved 2015-12-22. ^ “Resolution 2015-1 the Compassionate Medical Cannabis Reform Resolution”. Office of Constable for the 9th Ward of the City of Sunbury, PA. 2015-01-20. Retrieved 2015-12-22. ^ Staff, WJAC Web. “Gov. Wolf signs medical marijuana legalization bill into law”. WJAC. Retrieved 1 November 2016.